2018 Staff Reunion at Cornerstone Brewery in Berkeley! The 2nd annual Staff Reunion took place on November 23, the Friday after Thanksgiving, with over 50 current and nostalgic former Staff members ranging all the way back to the 50’s gathering at Cornerstone Brewery in Downtown Berkeley! FOBTC bought the first round, gathered around the fire pit, and gave staff an update and a chance to ask questions on the rebuild process. 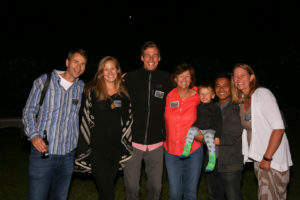 It was so sweet to see everyone, and so inspiring to see how many former staff are staying so connected to Camp! 2018 Update and Newsletter – The Tuolumne Spirit 1922 “Tuolumne Speakeasy”- A Fall Gala event for the ages!